It’s been months since I tackled one of the monthly questions posed by the Classics Club. I look at the question at the start of each month, decide it will take some thought – and then spend the rest of the month cogitating but never coming to any conclusions. Procrastination is definitely not helpful in this case. I’ve only just seen this month’s question so let’s see if I can do better if I just answer it right away. Have you ever read a biography on a classic author? If so, tell us about it. If you had already read works by this author, did reading a biography of his/her life change your perspective on the author’s writing? Why or why not? // Or, if you’ve never read a biography of a classic author, would you? Why or why not? I don’t read many biographies but one that stands out for me is The Unequaled Self, Claire Tomalin’s biography of Samuel Pepys. I already knew something of Pepys’s life by reading some extracts from his diaries as part of my history studies at school, mainly the sections in which he wrote about the Great Fire of London and the plague. Being adolescents of course we went searching for some the more bawdy entries. What I hadn’t realised until reading Tomalin’s book was just how powerful a figure he was in the seventeenth century, becoming Chief Secretary to the Admiralty under both King Charles II and subsequently his brother King James II. It was Pepys apparently who laid the foundations of professional standards in the Royal Navy. Not bad for a tailor’s son who at various times was accused of bribery and of secretly following the Catholic faith. Plague, fire, civil war, treason, the fall of kings: Samuel Pepys experienced them all. His was a life that coincided with one of the most momentous periods of English history and he recorded his experiences in meticulous detail in leather-bound diaries writing every day for nine years. 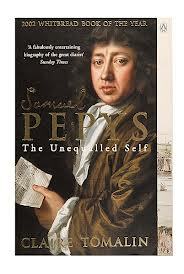 While these journals tell us much about Pepys the man, they still cover only part of his 70-year life. His first entry is dated January 1, 1660 when he was 26 but he ends his endeavours on May 31 1669 when he was forced to stop writing because of an eye problem. We learn much about his daily domestic routine, (what he ate and drank, the books he amassed in his library, his suspicions of his wife’s relationship with a dance master) and about landmark events such as the Great Fire of London as well as his many encounters with Royalty and politicians. Such a rich source of original material would be a gift for any biographer but for Claire Tomalin they didn’t go far enough because they tell us nothing of Pepys’ childhood and education or, after the Restoration, his public disgrace and humiliation. Through extensive research and examination of contemporary letters and diaries, Admiralty papers, judicial reports, memoirs and biographies, she seeks to fill in these considerable gaps in Pepys’ story. In The Unequaled Self, the tale she tells is an extraordinary one: a story of a man who rose from humble origins as a tailor’s son of one of the most wealthy and powerful government figures in the seventeenth century. Tomalin shows how much of this was due to some wealthy and influential family connections to the Earl of Montague (later Lord Sandwich) who nurtured the education of the young boy and then helped him gain his first government position as Clerk of the Acts to the Navy Board. He put his quick mind and aptitude for detail to work, supplementing his natural talents with private tuition in mathematics and using models of ships to make up for lack of real experience at sea. His endeavours may have had lasting impact on the British Navy (he is credited with introducing a requirement that all new officers first pass an exam) but they did not endear him to many figures in the Establishment. They resented his close relationship with the Duke of York who later became King James II; his growing wealth and his elevation to a yet more senior role as Secretary for the Admiralty. Pepys was accused of bribery and threatened with incarceration in the Tower of London and then faced further humiliation when he was accused of harbouring Catholic sympathies. He survived both, continuing in his positions until his patron and friend, King James was forced to leave the country. Tomalin tells the story with panache and energy. Although she has to resort to guess-work and surmise on some occasions, she never stretches credulity too far. Nor, although much of what she writes is necessarily full of facts, she never allows that detail to get in the way of telling a good story. One of the most memorable episodes she tells is of the operation Pepys underwent to remove the bladder stone which had given him excruciating pain for decades. In Tomalin’s imaginative re-creation we experience the same tension Pepys must have felt as he was trussed and bound to the bed and sense every moment of the operation he suffered without the benefit of anaesthetic or numbing alcohol. Tomalin treats her subject with warmth, enjoying his pleasure in ordinary human activities and admiring his curiousity, his love and support for learning and his intelligence. She acknowledges his egotism, his often bad treatment of the women in his life and his lecherous behaviour but concludes that these never dim his brightness so we ‘rarely lose all sympathy for him. His energy burns off blame.” It’s a credit to Tomalin’s skill that we come to share her enthusiasm for this ‘most ordinary and the most extraordinary’ of men.